When processing online payments through FreshBooks Payments powered by WePay, there is a transaction fee included. Pricing is very simple - it's 2.9% + $0.30 on all credit card transactions, with the exception of American Express, which is 3.5% + $0.30. Payments made with Bank Transfers (ACH) are 1%. There are no monthly or setup fees - you only get charged when you make sales. * These are the most common domestically issued card types and processing methods. They do not represent all the possible fees and variations that are charged to the merchants. ** International transaction is defined as any payment made with a card that was issued in a different country than your own. *** These fees are applied when using the Advanced Payments add-on with card not present transactions. 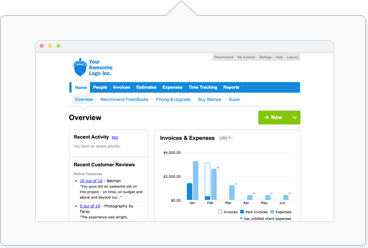 All transaction fees are automatically logged as Expenses in your FreshBooks account. You can also log into your WePay dashboard to see the fees deducted from your transactions.